Andrew Low has been quietly building bicycles in his hometown of San Francisco, California, since 2010. His first bicycles were made specifically for the track racer and fixed gear crowd. His philosophy is to be true to the sport, and his first bikes were made specifically for track racing events such as the match sprint and pursuit. Though he started his company at the height of the ‘fixie’ movement in San Francisco, he remained true to the sport with the goal of making the best and fastest bikes for racing. If a rider wanted to take the track bike to the streets, Low was fine with it, but it was not the intended design. 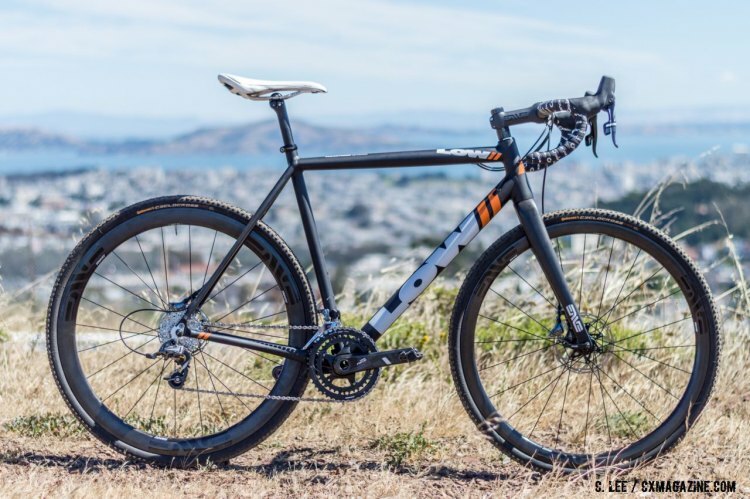 The new MkII cyclocross bike is Low’s latest creation, and we had our first look at it earlier this year at NAHBS 2016. 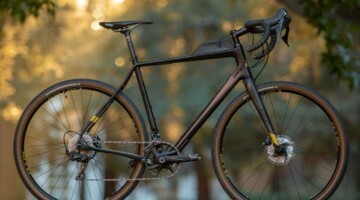 After expanding from track to the road to accommodate his riders’ expanding needs, he found the growing desire for a cyclocross and gravel bike, and recently got our hands on one of the first production models for a full review. Today, we take a close look at our review bike in Part One of our press. Not out to reinvent the category, but rather to still deliver the best race bike for the money, Low stays with tried and true geometry while keeping the bike modern and relevant. The bike has taken a couple of years to develop, and it’s been no small endeavor. Although the bike has modern cyclocross geometry and disc brakes, thru-axles are not part of the design. But Low is continually evaluating and refining his designs with some input from the TCB Courier team that he sponsors. The MkI was a prototype that the team rode and raced, and the MkII production model includes all the refinements garnered from the MkI development. 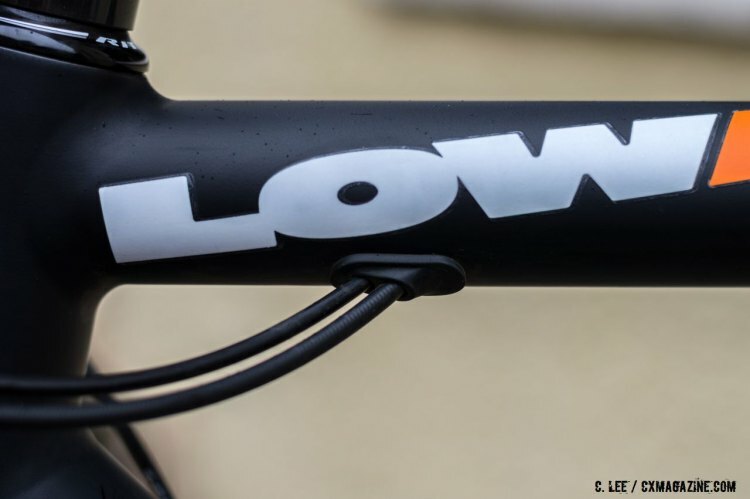 Low bikes are custom made in small batches, starting with a ‘standard’ geometry that Low has for each category: track, road or cyclocross. Low feels that aluminum is the ideal material for a race bike because of its “bang for the buck.” It’s light, strong, tunable with tubing gauge and size and cost effective. He custom sources 7005 aluminum tubing from a large Taiwan supplier, specifying tube diameters, butts and gauges depending on the bike he is building, including size and purpose. For example, the downtube for the ’cross bike is a bit smaller diameter than the the road bike for better ride compliance, with the added benefit of easier grasping to flip the bike to your shoulder. Low welds all the frames himself using a double pass technique that leaves beautifully radiused joints and requires no filing or polishing after welding. He uses primarily round tubes selected to achieve the desired ride quality he and his team concluded was best for a cyclocross race bike. There are a few tubes Low and his fabricator Michael shape in-house using self-fabricated tools. 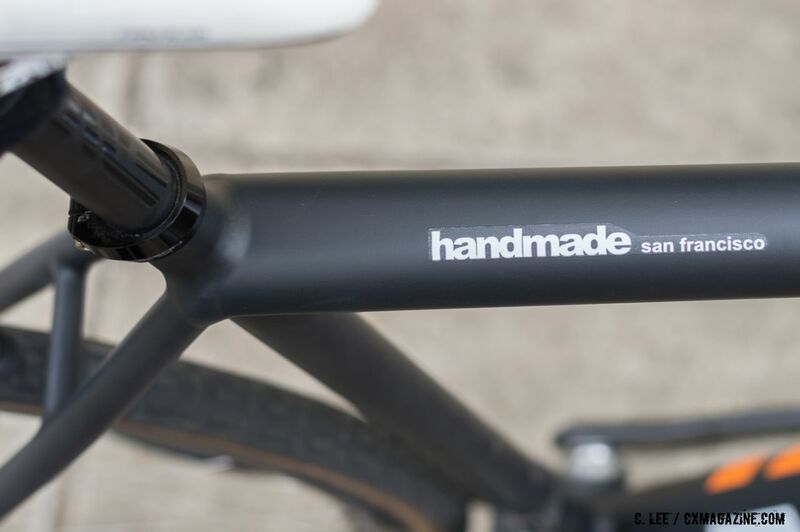 The chainstays have an S-bend and indentations for tire and crank clearance, and the top tube is ovalized at the seat cluster to meet the seatstays, allowing an internal control cable run through the seatstays. Low adjusted the entry point for those control lines into the top tube for smooth bends and clean aesthetics. The seatstays bow gently from the seat tube as they arc towards the rear dropouts, braced by a bridge that allows plenty of vertical tire clearance. The seatstays are flattened midway to allow some ride compliance giving the tube a round-oval-round cross-section. 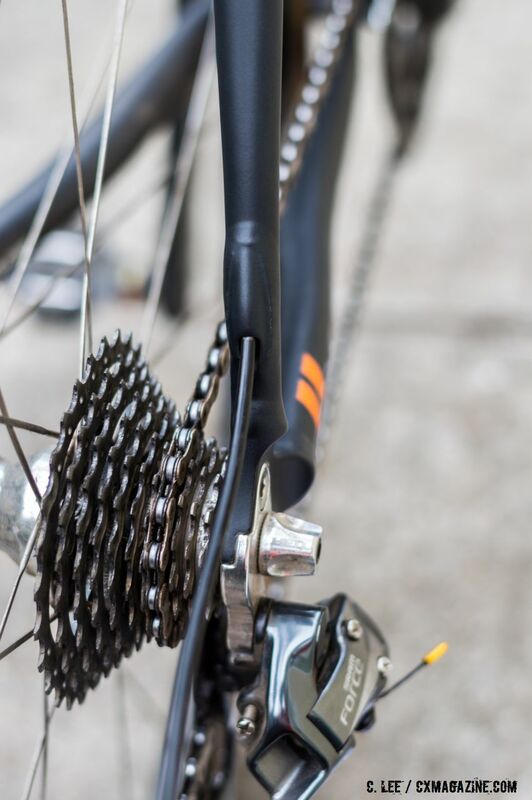 Although the rear control lines run with full housing from end to end, the front derailleur cable runs naked within the downtube, using housing stops at its entry and exit. As mentioned, the geometry does not vary much from tried and true modern ’cross bike geometry. Our 56cm production sample has a 56.5cm effective top tube with a 72 degree head tube angle matched to a 74 degree seat tube. With 42.5cm chainstays and a 7.0cm bottom bracket drop, that gives a wheelbase of just over 103cm and a front center on the slightly longer side for a 56cm bike at 613mm. Low is old school in that he uses a standard 68mm threaded bottom bracket shell, avoiding creak-prone press fit bottom brackets. Behind this shell, Low bridges the chainstays and seatstays, a design feature he found to enhance the ride and handling. 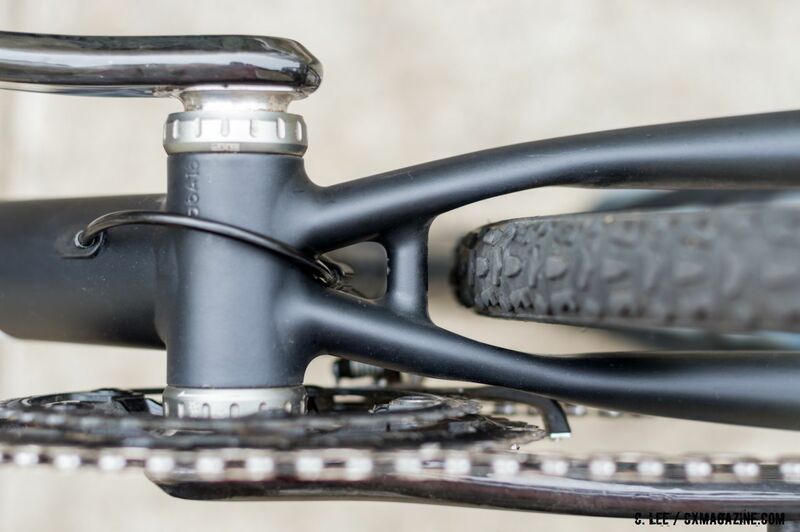 This limits the maximum tire width to 40mm with minimal knobs and even that’s a squeeze. It looks much more comfortable with a 38mm tire. The tapered headtube on the 56cm frame is 160mm tall, making for easy bar positioning. The headtube is domestically machined internally and externally to fit the integrated headset and give it a nice gradual taper. After final welding and alignment, the frame is heat treated in Low’s self-fabricated oven and rechecked for alignment before it is ready for paint. Low chose a matte black powder coating as a backdrop for his bold but simple graphics. The finished frame has a matte clear coat for protection. For an upcharge, another color or a raw aluminum finish is available. Dual bottle mounts are standard, but there are no rack or fender mounts. 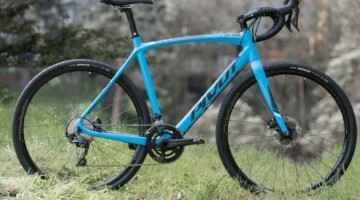 After all, this is first and foremost a purpose-built cyclocross race bike. Low can add custom geometry parameters for a customer, and it is simply absorbed into the small batch production runs of six frames, a number Low found to be the most efficient for him and his team. 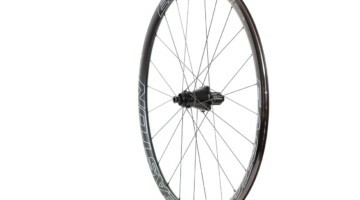 The included fork is the venerable Enve CX QR. Although Low Bicycles is a frame manufacturer, complete bicycles are available either through a dealer, or from Low directly. Our review sample came nicely equipped with a full Force 22 Hydro setup with Enve SES 5.6 carbon wheels. The Force 22 crank has 46/36 chainrings, and the cassette is 11-28 giving a typical ’cross gear range for a rolling course. Low set up the bike with SRAM HSX centerlock rotors, 160mm front and 140mm rear. The bar, stem and seatpost are all Enve contributions in carbon, the latter a double-wedge design. Thanks to the riding conditions of ’cross with hard saddle landings, we’re always wary of seat angle shift, especially prevalent with single bolt clamps and wedge clamp designs even when they are torqued to specification. The double wedge design spreads the load more evenly, and perhaps offers more surface area for the mechanism to hold the saddle in place. The post is topped with a Ritchey WCS Contrail saddle with chromium nitride titanium rails. The SES (Smart Enve System) 5.6 disc wheelset system is built with Enve road tubeless aero rims around DT Swiss 240 centerlock hubs with 24 front and rear spokes. 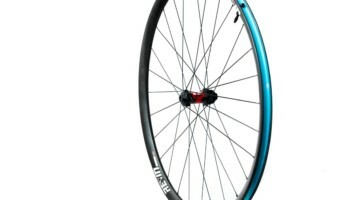 These come within five percent over their claimed weight of 1,528 grams for the pair, and are road tubeless compatible. With its 19mm internal width, and the bead shelf profile, it performs well with a good tight tubeless cross tire like the Vittoria TNT XL or WTB CrossWolf or CrossBoss. 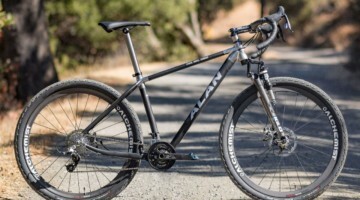 The Enve wheels and components keep bike weight in check and certainly add a bit of bling, bringing the final curb weight of the bike to 18.25 pounds. The Low MkII Cyclocross bike is very attractive with its bold graphics set off on the matte black paint, like chalk on a blackboard. The welds are so smooth it appears that the frame is fillet brazed and even the bold tube diameters seem to all match aesthetically. The 51.0mm diameter downtube is a single mm smaller than the small RedBull can, a cm smaller than a pint bottle, so is easy to grasp with my size L gloved hand. The 42mm diameter top tube has a nice radius to sit comfortably on your shoulder for a long run section. We first took the MkII Cyclocross on its intended mission of cyclocross racing. While it’s not cyclocross season, we are in proximity to several courses used by local promoters, and the weather near headquarters can sometimes mimic mild winter ’cross conditions even in early summer. Stay tuned for the full ride review and our verdict!